Studies: modern glacier retreat unprecedented. May 19, 2013. Nearly 70% of the world’s freshwater – over 24 million cubic kilometers - is frozen, locked within ice caps, permanent snow, or glaciers. That ice holds less than 2% of Earth’s total reservoir of water, yet sea levels would rise by hundreds of feet if it all melted. A complete thaw is not on the horizon, but even sea level rises of several feet would render many coastal cities uninhabitable. Hence, although glaciers only constitute 1% of the world’s total land ice, we desperately need studies that measure their response to global warming. Recent research by lead author Alex Gardner of Clark University revealed that glaciers lost an average of 260 billion metric tons of ice annually between 2003 and 2009. That alarming conclusion suggests that, during the study period, glaciers contributed as much to sea level rises as the Arctic and Antarctic ice sheets combined. While this information is valuable, it requires the context provided by research into the deeper past, without which the recent retreat of glaciers can be dismissed as just another quirk of short-term variations in weather. A new study by Lisa Wood and Dan Smith of the University of Victoria contributes to such scholarship by employing tree ring records to reconstruct relationships between climatic trends and the mass of British Columbian glaciers from 1780 to the present. 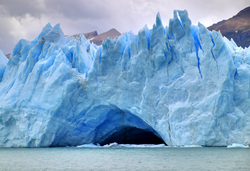 To expand, glaciers need sub-zero temperatures and adequate precipitation. The British Columbian climate reconstruction reflects only moderate warming since the nineteenth century, with significant variability of average annual temperatures between roughly thirty-year intervals. In particular, several cold decades late in the twentieth century demonstrate that weather experienced in several successive years – or even decades – can mask broader climatic trends. Moreover, global warming can alter regional climates in different ways, with different consequences for particular meteorological variables. Still, the conclusions reached by Wood and Smith reveal that British Columbian glaciers are losing mass at rates that are without precedent in more than two centuries. The answer lies in the precipitation data provided by the tree rings, which reflect a steady decline in snowfall since 1880. The decline in winter precipitation, alongside a slow but uneven rise in regional temperatures, is sufficient to explain the rapid retreat of nearby glaciers. Other studies that employ tree rings have revealed that this retreat has been mirrored across western North America and, indeed, the world (right). Sadly, this is hardly surprising, as glacier extent has served as a “proxy” – a measurable reflection – of changes in past climates. In fact, the first great cold phase of the Little Ice Age has been called the “Grindelwald Fluctuation,” because of the expansion of the glacier near Grindelwald between 1560 and 1630. A world bereft of such icy climatic measuring sticks would be without parallel for millions of years into the past, but our best evidence reveals that it is just around the corner. 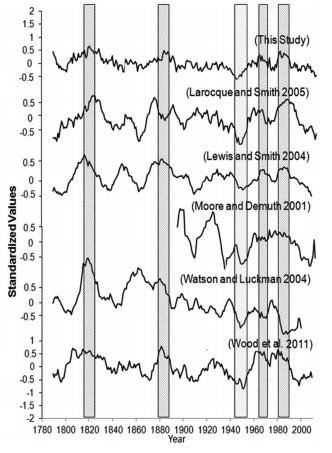 Wood and Smith, "Climate and glacier mass balance trends from ad 1780 to present in the Columbia Mountains, British Columbia, Canada." The Holocene 23:5 (2013): pp. 739-748. Reconstructions of glacier mass in western North America. Wood and Smith, 746.